If you’ve been reading ShortList for a while, you would know that when it comes to staycations, we do not mess around. We continually search the city, nation and the region for the very best staycation offers. Be it in terms of affordability, services and or location, we are always searching for ways to ensure that our readers find the option that’s best suited for them. 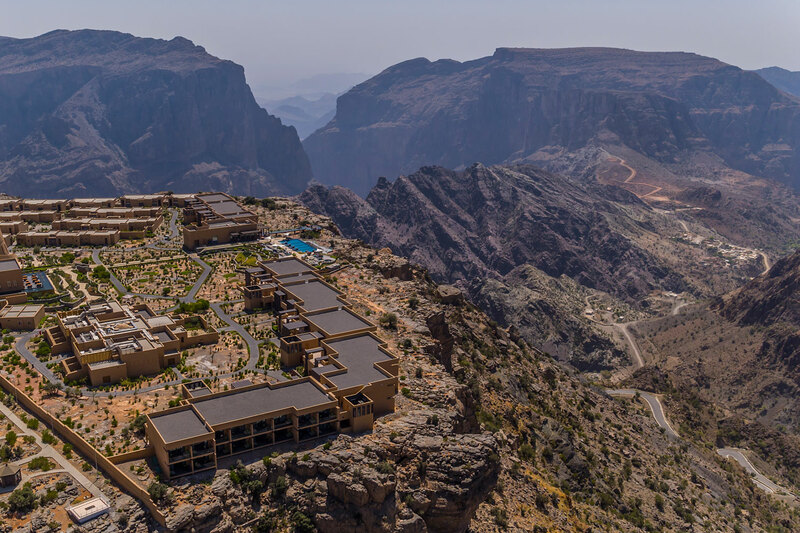 During our latest hunt, we discovered Anantara Al Jabal Al Akhdar Resort. The infamous five-star resort that is located at the very top of the Al Hajar Mountain (Green Mountain) in Oman. While it may be further than most of the staycation deals that we usually write about (it’s a seven hour car ride or a 40 minute flight from Dubai Terminal International Airport to Muscat, which is followed by a two hour drive to Nizwa), it is certainly well and truly worth the effort. The rewards are a landscape and geographical make up that brings to mind a scenery perhaps more commonly associated with countries like Albania, South Africa and parts of Jordan. Also, there’s the overwhelming feeling of relaxation that fills you from the very second that you enter the stunning venue 2,000 metres above sea level, which results in temperatures some 15˚C cooler than the cities of the UAE. It’s little surprise, then, that its peak season is during the summer. The stunning views and excellent weather are far from all this venue has to offer, though. From seamless service and excellent cuisine to adrenaline-packed adventures and activities, this resort is one that will forever be etched in your memory and, dare we say it, heart. 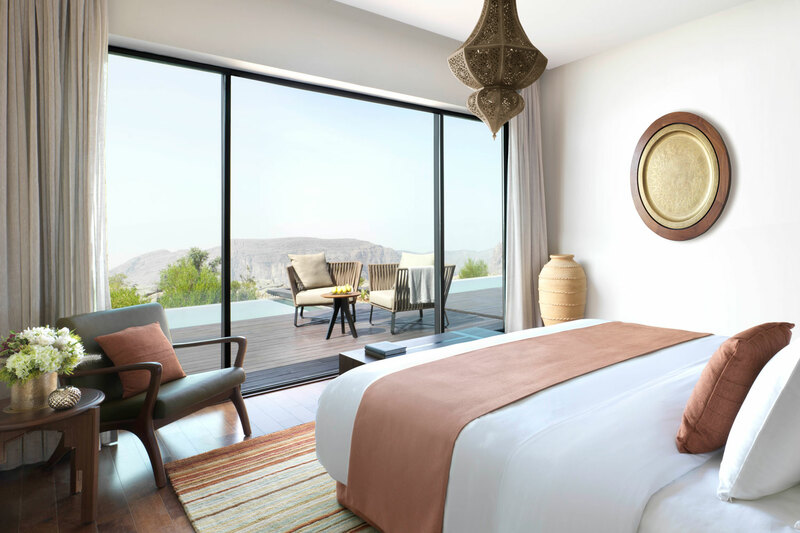 Much like its international counterparts in areas like Thailand, South Africa and the Americas, the rooms in Anantara’s Al Jabal Al Akhdar feature strong wooden accents alongside the latest technology. Each of the 115 rooms also feature a signature piece of art that is emblematic of its host nation; in this case, it’s a gold-plated serving tray that can be found hanging either on the bedroom or living room wall. Speaking of unique keepsakes, the 33 villas all feature a number of books and an art easel as rumour has it that when Prince Charles and Princess Diana visited the area, Charles would paint while his now late wife would spend her afternoons reading. If you’re travelling with friends or family, we recommend that you book a villa. There’s a choice of three: a one bedroom garden or cliff villa, perfect for couples; a two bedroom garden or cliff villa, perfect for families; and a three bedroom royal mountain villa, which are often used by celebrities and government officials. Should you opt for villa we suggest villa 4, 5 and 11. Villa and 4 and 5 are located in the centre of the resort, so they offer the best views while villa 11 is located in the far right corner, so it is perfect for those looking for a bit more privacy. Regardless of your choice, all of the resort’s 115 rooms offer in-room dining and are located no more than eight minutes away from all of the resort’s leisure activities, which includes an in-house gym, and restaurants. What sets Anantara Al Jabal Al Akhdar apart from other staycation venues is not only the fact that it caters to the whole family – there’s a kids and teen club, a main pool and a number of restaurants on hand – it’s how the resort has made the best use of its surroundings, in this case the famous Green Mountain. While guests are free to try their hand at everything from zip-lining to rock climbing here, we suggest taking part in the resort’s Wadi Al Bawaarid hike. Suited for intermediate and advanced hikers, the two-hour long journey explores the mountain’s three neighbouring villages of Al Aqr, Al Ayn and Ash Shirayjah. Fun fact: the entire area was once home to hundreds of farmers, rosewater makers and garlic harvesters, but after the land ran dry, all of the residents left and started life on a new mountain –all except for one, a rosewater maker bordering on the age of 100. If you get to Al Aqr early enough, you can see him go for his morning walk. Some key features to keep a look out for as you stride over the area are its many fossils. Everything here, despite its elevation, was once underwater. Just as notable, at least for photographers and lifestyle magazine editors, are the profusion of multi-coloured doors, which adorn a million prints and travel features. We particularly liked, for what it’s worth, the pale olive green door found in Ash Shirayjah village. There’s also a delightful waterfall, which Maher, our tour guide and former mountain resident, seemed rather reluctant to reveal. But, while not especially large, it made for a great photo opportunity. If you’d rather take in your dose of culture and history sitting down, you can do so at Diana’s Point. 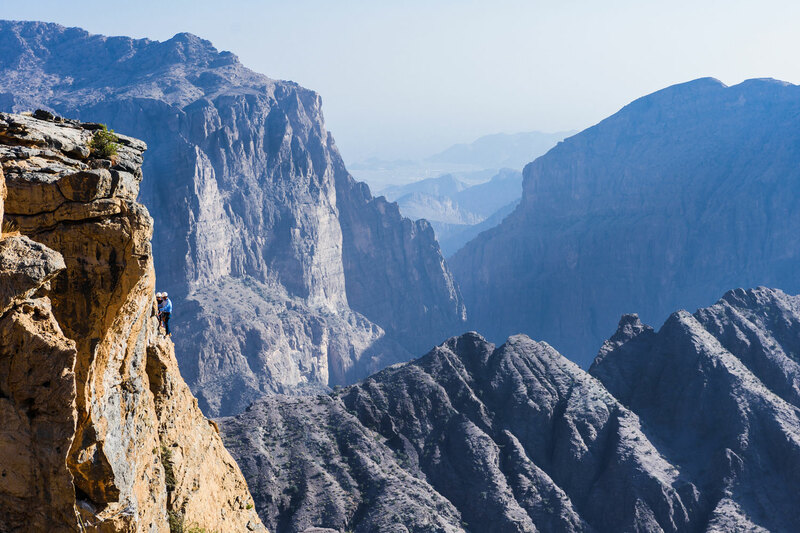 As its name suggests, it is named after the late Princess Diana who along with Prince Charles visited the mountain during their 1986 tour of Oman. The site is not only popular with history buffs, it has become known as being the perfect place to propose. The venue is home to five signature restaurants, each of which specialise in a distinct cuisine from across the globe. If you’re a fan of Arabic food, Al Qalaa is the place for you. It is home to a number of seafood dishes that have been sourced from local fishermen and hearty meat treats commonly found in the Middle East like mixed grills and kebabs. Bella Vista is the resort’s Italian restaurant which overlooks Diana’s Point. Dishes like the grilled seafood platter, the lamb chops and the quattro formaggio pizza are not to be missed. If you’re a fan of truffle, the mushroom risotto is a must. If you’re looking for something a bit more intercontinental, La Maisan, is your best bet of tasting the very best that the globe has to offer. Just a heads up, the nights are themed so, if you’re a fan of Chinese food, be sure to make a booking for Friday. Also, the venue which when translated means “amazing star”, has some of the best breakfast pancakes and churrios in the region. If you’re a night owl, make a post-dinner detour to Al Qalaa for some shisha. The venue’s resident oud player sets the scene for a magical night amid the chandeliers and opulent furnishings. Once the venue quietens down, which is usually after 11.30pm, he is open to special requests – as long as the songs are Arabic. 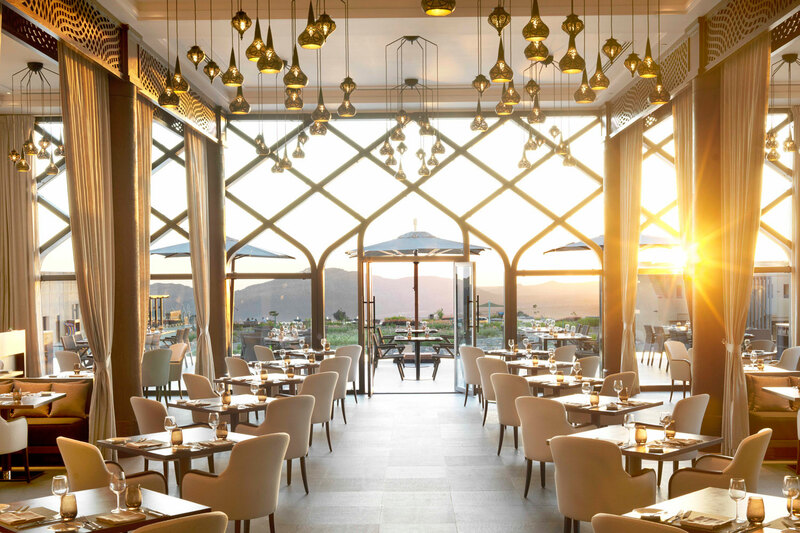 If you’re looking to reconnect with nature or if you’re looking to boost your Instagram game or to familiarise yourself with one of the oldest nations in the region, a trip to Anantara Al Jabal Al Akhdar Resort is the perfect way to do it. Price: One bedroom garden pool villas start at AED2,574 a night, flights from Dubai to Muscat start from AED479 with SalamAir.